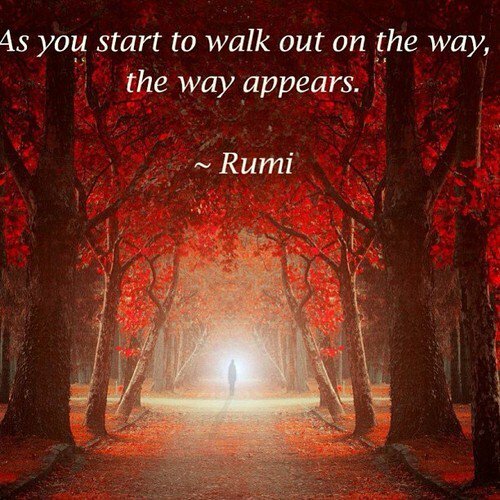 I adore Rumi. The wisdom within his poetry has long guided me. Within this small line: the importance of faith. Not necessarily directed toward any particular diety. Simply regarding our community. Our futures are unknowable until they become our past. Even then meaning slowly gets gleaned. I live with a dangerous mindset: desiring to understand all the ramifications of a choice before I act. This impossibility risks paralyzing me. Often, it has. Losing opportunity out of fear? That’s sad. I need to embrace that the way will appear when it needs to, and not a moment before. And that this way is good, it is for the best. Believe the unknown and uncontrollable are not reasons to hide, to wait, relegating opportunity to vapor.